Pure is a big name with a lot to offer, and they have produced a whole host of home electronics – especially those that play CDs or radio stations. As a result, they have quite the reputation for being reliable and trustworthy as a brand, which is one of the reasons I decided to write a review for one of their DAB alarm clock radios. Crosley is an excellent brand to go for when you are in search of a new record player, and this is because they perfectly combine quality and affordability. Due to this, you always know what to expect when you pick up a Crosley record player, or any piece of tech that they manufacture, and this is part of why we chose their Keepsake model to review. The Crosley Keepsake is a record player that works to provide you with style and a retro feel while also embracing modern life and technology. It is filled with additional features that will leave you incredibly impressed, as well as ones that will take you back to the past – when things were simpler, and the most important aspect of your life was your music. As compelling as my argument for this record player, it’s best if you read my full and detailed review below so that you can really get a feel for it. Take a moment to relax, grab a cup of coffee, and see if this Crosley record player review encourages you to get the vinyl records out. Sleek and stylish, this record player doesn’t just look amazing, it plays amazingly as well. 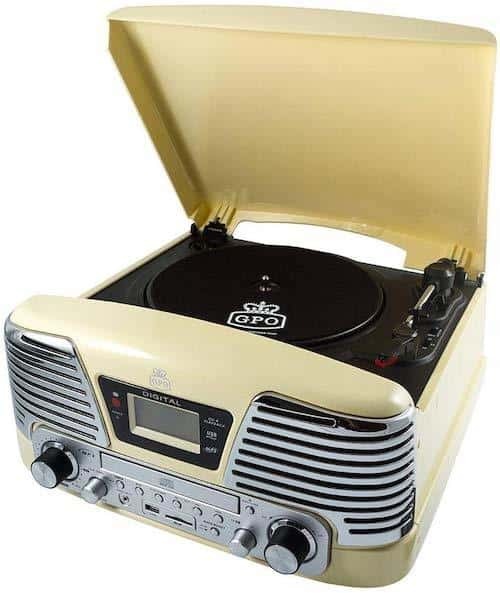 Packed full of exciting features that combine the classic feel of the record payer with a touch of modern life, the Crosley Keepsake is an excellent example of bringing old tech into the younger generations. The Crosley Keepsake is a testament to the classic record player. Perfectly combined with modern features, it has a lot to offer. From USB file conversions to playing your favourite records, it has everything you need for a comfortable night in. All this model does is promise a great, and portable, listening experience from the comfort of your home. However, there are some situations where this might not be the ideal record player. It has great features, but not things like Bluetooth connectivity, and sometimes it may need a few adjustments for the automatic stop feature to work perfectly. If you are an avid music fan, you might want to check out a model with a slightly higher price tag and a few more gadgets. This record player has a really smart design and retro feel as it comes in a briefcase, complete with handle, that you can open and close. As a result, the top of the case also acts as a dust cover to protect the record player inside. Additionally, you can choose from four different colours and styles, allowing you to pick the one that you know is going to work for you and your home. The controls are very simple and easy to access as they are located on the top of the turntable as well as clearly labelled. The volume control is also included here, keeping everything close together. While easy to use, they are a little close to the arm and stylus, which can be a little fiddly if you aren’t careful. Otherwise, they make for the perfect set of controls. To save you time and effort, the Crosley Keepsake also has an automatic stop feature, meaning that it will end the track at the correct time and move onto the next without you needing to get up and adjust it yourself. However, depending on the size of your record, you may need to make a few manual alterations so that it does not end the track early as a result. The hardware used in this record player is all brass plated for quality and durability, so you know you are getting a sturdy piece of kit. Similarly, there is also a diamond stylus needle to ensure the best possible accuracy, hardwearing, and also to decrease the risk of potential scratching on your records as a result of the needle. The arm is also nicely balanced and can be adjusted easily. 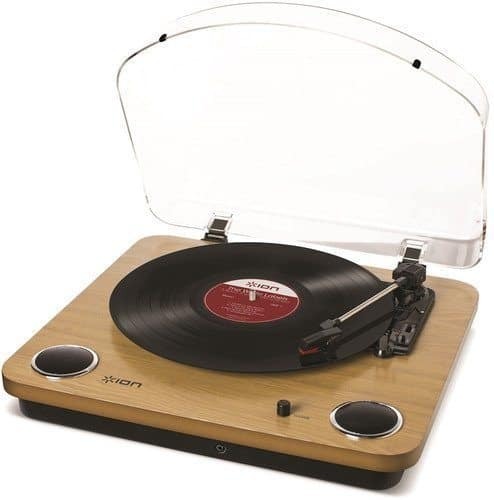 The Crosley Keepsake has some great additional tech features for you to play with as well. The USB link is one of the most exciting, and it even comes with the cable you need to connect everything together. You can hook the record player up to your computer and convert your vinyl discs into digital files that you can listen to on your way to work or just when you want some private time with your music. It comes with some easy to install software that will help you with the conversion process so that you have full control over the situation, including the editing process. There are speakers built into this record player, and they are quite good considering the money. The sound is good, and the quality not too tinny, although you might find that it distorts a little on maximum volume. If you are really into the sound, there is an AUX input that you can use for external speakers. These are quite cheap to pick up, even for top quality ones, and they can enhance the overall listening experience. 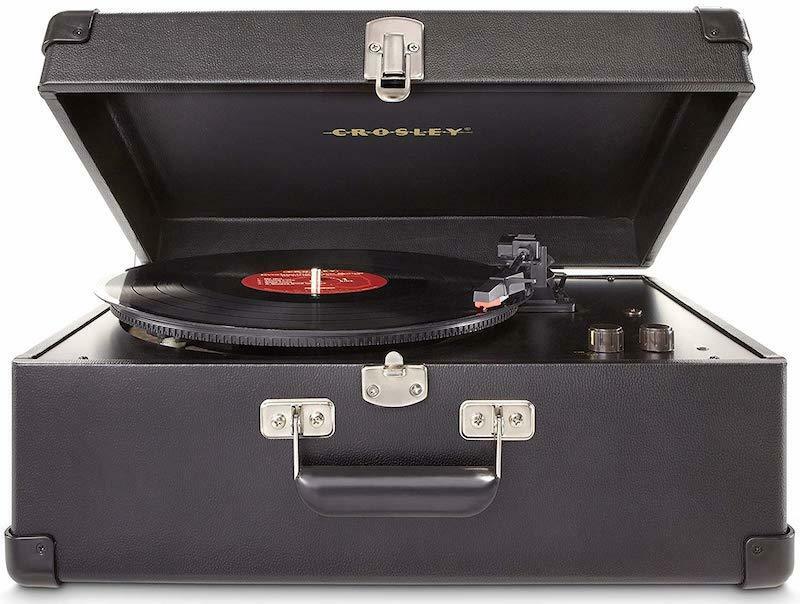 The Crosley Keepsake comes in quite a compact size, and the briefcase design also means that it is very portable – so you can take it with you everywhere and let everyone enjoy your favourite music. 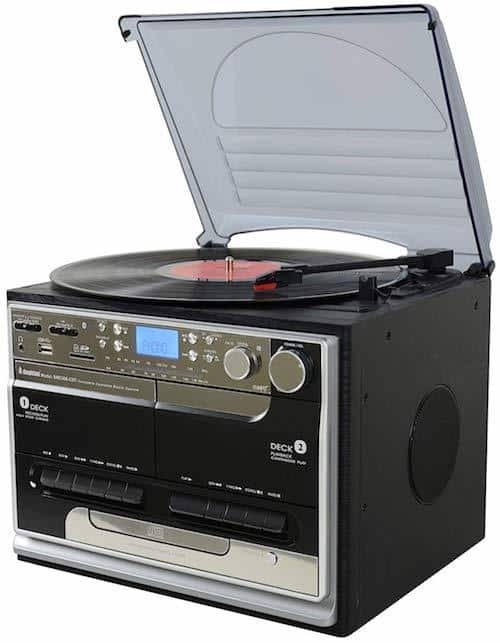 It is one of the best portable briefcase record players you can find. The handle is strong and comfortable, which is ideal for long journeys, and it just looks so good when it is all packed up. Additionally, it is remarkably light to hold and carry – all without feeling cheap and plasticky in the process. Overall, it makes for a record player that is easy to handle and transport. Here are some other, similar, models of record player for you to consider, just in case you want to look at other options before you commit to the Crosley Keepsake. This record player comes from a top brand and sports a really nice design. Smooth and sleek, it is portable and also comes with a protective dust cover. It has three speeds for all records, as well as clear built-in speakers for your listening pleasure. With a USB port for digital conversion, if you fancy it, you don’t need much more than the affordable price tag to be convinced. The unique design sees the GPO Memphis record player hiding under the guise of a classic stereo, leaving it with a really funky design. The controls are on the front and very easy to access, and it is able to play three speeds so that each of your records can be dusted off and played again. Additionally, there is a USB port so that you can convert your records into digital files with ease. This record player may be chunky, but it also has a lot of tech for you to play with as well as some fantastic speakers that really will blow you away. You can hook up anything from your mobile phone to your computer for easy streaming, as well as play records at three speeds. It even has FM radio included, and all of it comes at a pretty fantastic price considering. We hope that you have found this Crosley record player review helpful, and that all of the information we have provided has given you a good idea as to whether or not this is going to be the best vinyl record player for you. This model has so many fantastic features that it can be difficult to keep up. The fact that it comes at such a reasonable price is a massive bonus, as well as its ability to convert your vinyl tracks into digital ones for listening when you are commuting or just want some private listening. The speakers could be better quality, it certainly doesn’t have some of the more modern features like Bluetooth, and it might need a little adjustment with regards to the automatic function. However, what makes this record player so good is that it stays true to its classic roots while also offering you value for money and a great way to listen to what you love. 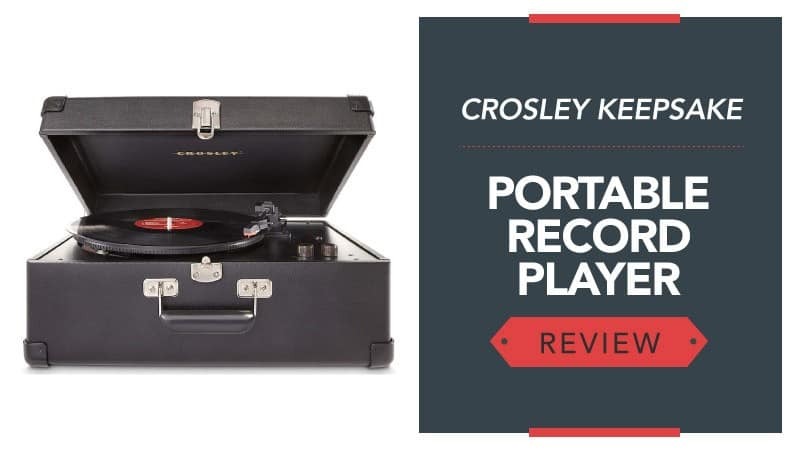 What did you think of our Crosley Keepsake review? Do you agree with our thoughts on the radio we reviewed, or are there others that you think are better suited to the task? We love hearing from you, so make sure you leave us a message in the comments below.